When the Halloween night festivities end many of us notice a distinct change. The leaves begin falling, the cool weather sets in, and the overarching feeling of the holiday kicks into a frenzy. The cold weather outside may leave us desiring for a cuddle buddy or someone to bring to the work holiday party. But this desire often manifests itself into something greater and we wind up fooling ourselves into thinking we "need" a relationship. This can all culminate into SAD - Seasonal Affective Disorder. The Mayo Clinic describes SAD as a subtype of depression that's related to the seasons, and it begins and ends around the same time each year. It most commonly takes place during the end-of-year holiday season. The symptoms include: irritability, tiredness, oversleeping, and trouble getting along with people. Perhaps it is the drop in the amount of daily sunlight that interferes with the circadian rhythm and reduces serotonin. There may be physiological causes such as the ones described; but there are many cultural aspects that increase the onset as well. It is when you hear the Christmas carols playing, see the Menorah's being lit and Ralphie begging the mall Santa for the Red Ryder BB Gun. You long for that hand to hold while walking through the main drag of Christmas lights downtown. You may already feel the hot lump in your chest about the inquiring family members and the empty chair next to us at the holiday gatherings. M = Maturity. Maturity is being comfortable in our own, amazing skin. Do you really want to just settle for someone? Or do you want to wait and enjoy all that life has to offer, in the present moment? A = Acceptance. This involves taking a realistic appraisal of your short-term and long-term goals. - "I'm only lonely at the moment and want a cuddle buddy, however, I don't want a long-term relationship and am happy single." D = Decisive. Decide whether you are ready for a relationship, if so, dive right in. But, I often tell people to listen to the small 10 percent of us that secretly enjoys being single. 90 percent of you may want a relationship but that 10 percent still relishes all of the freedom. When it comes to career, relationships, and major life decisions never engage at a sub-100 percent level. Ambivalence is the enemy of personal growth. Constructive life decisions are centered around balancing your emotions with reality. It is crucial to adopt this mindset and work on yourself now. This will pay off down the road if you decide on a relationship. In the end, you are not alone, single people in the U.S. are now the majority demographic. In 2014, the Bureau of Labor Statistics reported that 124.6 million Americans 16 years and older were single, or 50.2 percent of the population, compared with 37.4 percent of the population in 1976. It is clearly becoming the new norm, as people realize they don't need someone in order to be fulfilled. YOU are enough. Take a deep breath. Don't chase the Hallmark moment. 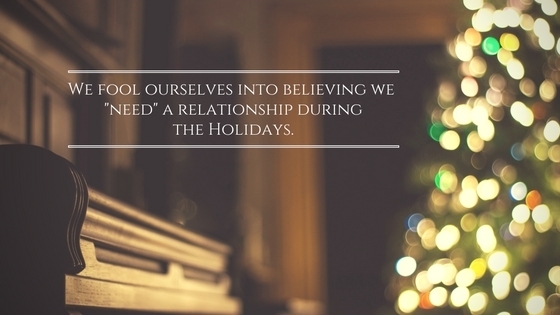 Enjoy the open-ended freedom, autonomy and all the other positives associated with single-dom during the Holidays. Most importantly, you decide who you get to make out with at midnight on New Year's Eve.